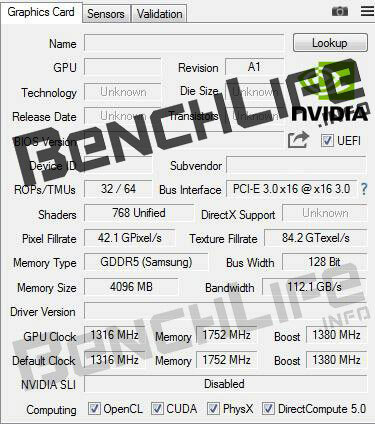 Chinese PC tech site BenchLife has published what it claims to be a GPU-Z screenshot revealing key specifications of a sample Nvidia GeForce GTX 1050 graphics card. The new entry level Pascal card will be based upon GP107, featuring 768 CUDA cores and a 128-bit memory bus. As you can see relayed by the screenshot above, BenchLife has erased the graphics card's Name, GPU, BIOS version, DeviceID, Sub-vendor name, and Driver version from the display fields. As it stands we don't know whether this is a reference (founders edition) model or a higher clocked version from an Nvidia partner. Important information remaining in the screenshot is that; 768 CUDA cores feature in the GP107, running at base 1316MHz with a 1380MHz boost, there are 32 ROPs and 64 TMUs, the example card has 4GB of GDDR5 memory on a 128-bit bus, running at 1752MHz, providing 112.1GB/s of bandwidth. VideoCardz reckons the GTX 1050 will be available, like its updated GTX 950 predecessor, as a purely PCIe powered card. According to BenchLife, the arrival of the Nvidia GeForce GTX 1050 will be timed for mid-October. The green team doesn't plan to shut down production of the GTX 950 and GTX 960 says the source. Looking at the competitive landscape it is thought the GTX 1050 will be pitched at some appealing spot between AMD's Radeon RX470 and RX 460. So basically a GTX 950 with higher clocks? I suppose the big question will be the pricing. £130 (~$149?) would make it 30% more expensive than the cheapest RX 460, for around 30% more performance? Interesting that it's clocked a lot lower than the other Pascal parts though … weight to the rumour that GP107 will be fabbed on Samsung 14nm? Or perhaps this is actually a load of rubbish (although the specs wouldn't be at all surprising given the market position)…? Its also a shame we are not seeing a consumer desktop part with a full Polaris 11 chip either. I don't think there's much doubt that AMD has deliberately gone for using one set of silicon for both mainstream laptop and mainstream desktop GPUs this time around. I look forward to seeing the laptop implementation of Polaris 10 (actually, I'd love to get hold of an RX 470 and mess with the clocks and voltages to see just what it could: I can't help thinking that it might be able to creep down towards a 75W TDP at ~ 950MHz/0.9v (which is probably the silicon sweet spot)). 75W would be really odd. Wouldn't you either clock a little slower for 70W and stay bus powered, or stick a 6 pin socket on it and crank clocks to the moon? If 75W *is* clocks cranked to the moon, then that implies it need a 6 pin power connector anyway so perhaps the power is a bit bursty. *I rather suspect thatmy naive calculation is actually on the high side - whilst it doesn't account for the memory subsystem (which is 2/3 of the 1060, rather than 1/2) lower clocks usually allow for a lower voltage to be employed, and power usage scales with the square of voltage so this has a larger effect on bringing the power down.